I love the idea of adding a fresh coat of paint to a cast-aside piece of furniture with great lines.It's relatively cheap, and allows you to match the piece to fit in perfectly amongst your existing decor. I found a coffee table on the street when I was living in LA with my two roomies Kristin and Berger, and (with lots of help from my hubby) I did just that....a rad furniture refurb! To say I underestimated what that entailed is an understatement - lots of elbow grease, lost brain cells due to spray paint inhalation (gotta love defective masks), and 3 days later, we had cleaned, sanded, primed, and painted the table. It's a shame I didn't take it with me when we moved to Boston.....but oh well, that just gives me an excuse to do another DIY project when we have a bit more space! For the non-DIYers out there, there is Mint Home. 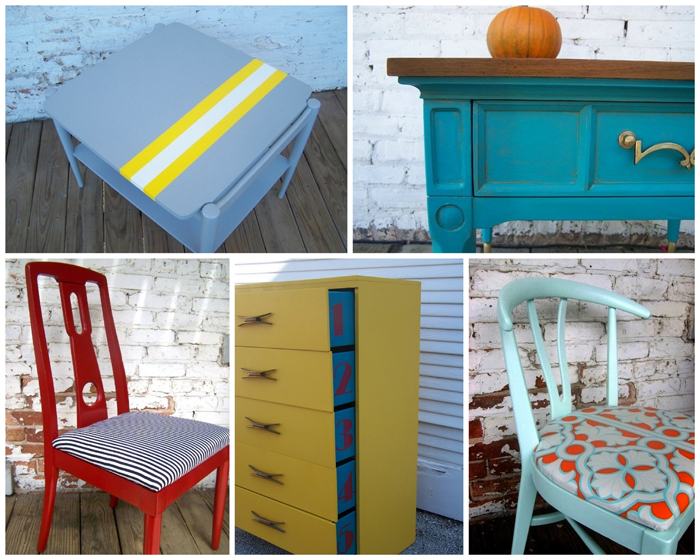 Think of it as antique furniture classics updated with colorful paint and upholstery for a fresh aesthetic. Owners and designers Keisha & Jessie are two ladies living in Chicago, and doing all the tough stuff for you....all you need to do is click, order, and enjoy your cool new vintage furniture (no crappy composite wood or veneer in this shop, so the stuff will last through years of wear and tear). You can also find a small selection of vintage home knick knacks in their Etsy shop as well. A sweet pair of chairs in a cheeky hue will set you back about $250, and a refurbed dresser with rad numbered drawers is about $450. While it's not "bargain priced" at first glimpse, it's definitely justifiable when you add up the hunt and cost of finding the perfect piece, the materials and TLC that goes in to the project, and the time it takes to do it well! these are fantastic. such fresh colors.